The windows in the church came from the Emperor Stained Glass Factory in Germany. 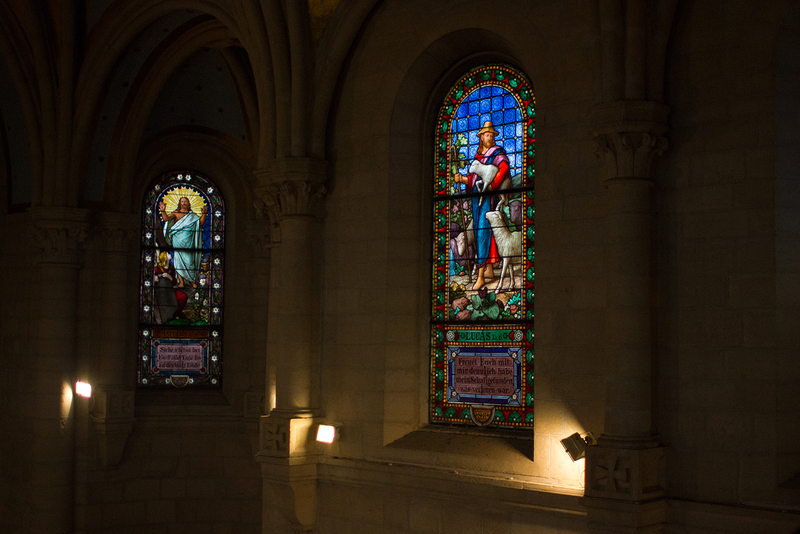 They are in a unique style, similar to German windows, and made to reflect the Bethlehem and Holy Land environment. In the church chancel, at the front, are three windows depicting the Christmas story, complete with angels, shepherds and the Holy Family. At the left, in a shallow, rounded chapel, are three windows showing the life of Christ until his baptism, including the flight to Egypt, portraying Jesus and his family as refugees. This picture is particularly pertinent and poignant for the congregation of today because two-thirds of the people re refugees themselves. At the right, in another shallow, rounded chapel, are three windows portraying Jesus’ passion and resurrection, with the crucifixion in the center window. The remaining windows in the main church are related to Bethlehem’s biblical history and landscape. The church was in the middle of fierce Israeli shooting and bombing in 2002. People were under curfew in their homes and could hear glass breaking everywhere. Pastor Raheb, who lives with his family in the parsonage on the church compound, also could hear glass breaking and feared it was the stained glass windows. No one could get out to check until a few days later. When Pastor Raheb finally went into the church he was astounded and grateful to see that all the windows were unbroken and intact. There is one small hole in the red robe of a person in the left chapel windows, which is hardly noticeable but serves as a reminder of the frightening chaos and the damaging attacks in 2002. The German architect who designed the Christmas Church was very well-known. He made drawings of the church and the work proceeded. The architect was astonished at the precision and fine-quality work of the Palestinian stone cutters. Even today one can notice the beautiful precision stone work of the Christmas Church. This same architect tried to think contextually, that is, he tried to incorporate Bethlehem traditions into the building. After consulting with people, he decided to design the tower or steeple of the church like the Bethlehem women’s traditional hat of the 19th century, a conical design. (The hat itself was about 20 centimeters tall, with a scarf hanging from the back.) The tower or steeple of the church, then, is high and conical with a cross at the pointed top. In February 2004 an earthquake caused part of the ring of concrete holding the cross in place to fall to the ground. The other half is still holding on to the cross at the top of the steeple. Work is in progress to repair the 110 year old tower. The organ in the church was manufactured in Berlin, Germany, around 1890. By the 1990s the organ had developed many problems and was basically unusable. A partner congregation in the U.S., the Lutheran Church of Christ the Redeemer in Minneapolis, Minnesota, took on the project of rebuilding the organ. 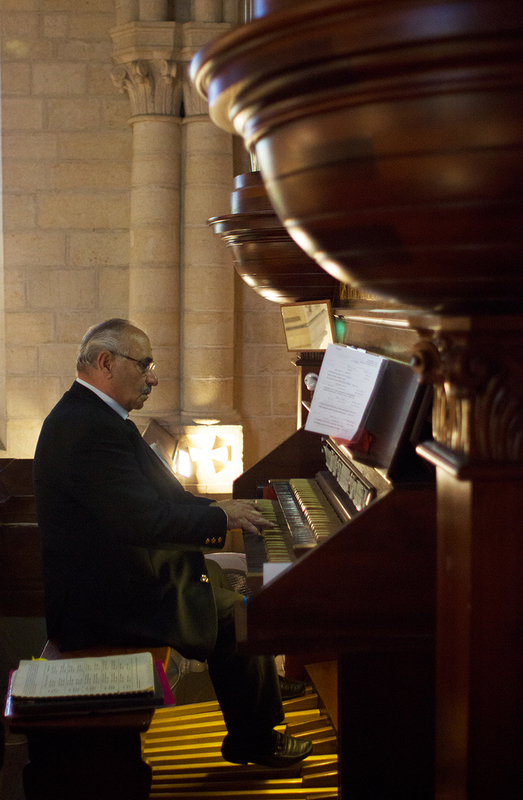 An organ specialist came to Bethlehem and took the organ completely apart. It was shipped to the U.S. where it was completely rebuilt and repaired, and shipped back to Bethlehem to be put back together and usable in time for the 2000 Millennium celebrations. Today the 19th century organ once again leads joyful and meaningful worship in the Lutheran Christmas Church. The bells in the church tower were donated to the church by Emperor Wilhelm II of Germany.